This year, the Interfax-ERA Rating Agency and the Ministry of Energy of Russia combined their efforts in composing the rating of implementation of the state policy on energy efficiency. Interfax-ERA (previously, ANO NERA) has been for 16 years collecting companies’ forms for environmental/energy studies. Forty nine hundred enterprises in all regions of Russia and Kazakhstan, 17 industries and 95 sub-industries are covered in assessments of environmental and energy efficiency. One of the major indexes of the energy efficiency level of a region is energy intensity of the gross domestic product and its dynamics. However, the level of financial provision and regional peculiarities are different, and most of the rating elements are directly related with the budget capacity. It is not unquestionably consistent to compare Moscow with the Far East. For this reason, all RF subjects were divided for the rating purposes into three groups based on the “lever of basic budget provision,” which had been calculated by the Ministry of Finances. Factors influencing the efforts on energy saving and energy efficiency in a region were divided into two categories: parameters for implementation of key energy efficient technologies and high priority administrative measures. 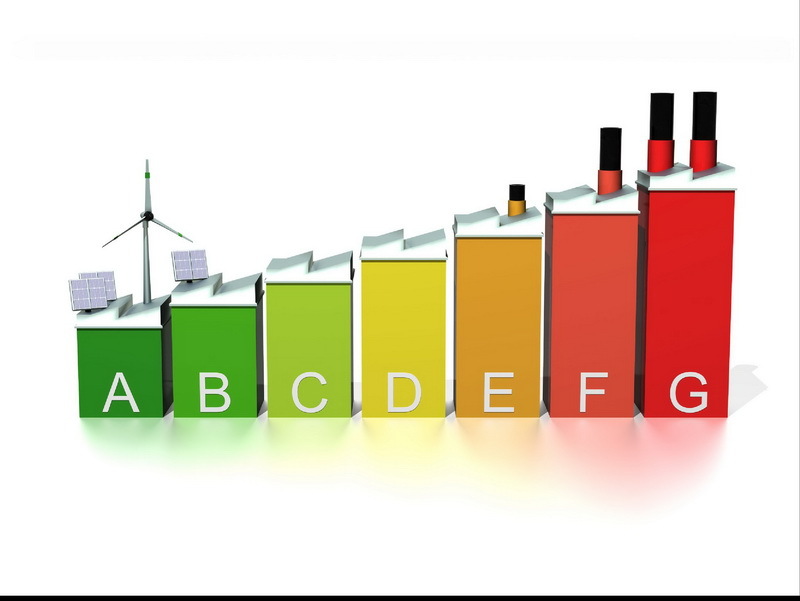 Rating was made on the basis of Rosstat (Federal State Statistics Service) data, information collected in the regions, State Report, and energy declarations, i.e., data on the energy efficiency of buildings, which budget institutions show in their reporting. Availability of energy efficiency requirements for construction development and capital repairs were also assessed. The rating leaders were those regions which paid attention to reporting and included energy efficiency indexes into the branch state regional programs. The Republic of Tatarstan which got the second position in the first group of regions with its 58.9 scores out of possible 85 gives a good example. Tatarstan was one of the first Russian regions to lay a course on energy efficiency. The republic has developed and adopted the Republican Program for energy resource efficiency. In the years of its realization, the Gross Domestic Product (GDP) of the republic has grown up by 40% with practically unchanged level of primary resources consumption. Average annual rates of energy intensity reduction in the republic had been two times higher than the rate of energy intensity reduction of the Gross Domestic Product (GDP) of Russia. Realization of the program allowed 28% reduction of the energy intensity of the gross regional product (GRP). St. Petersburg, which has got the third position in the first group of Russian regions, is one of the leaders in energy efficiency in outdoor lightening. The leaders of the region are one of the front-runners in the part of subsiding energy saving and energy efficiency. The region has been implementing a number of initiatives and has developed a series of regulatory and legal acts in this sphere. Some of the examples include the plan for energy efficiency enhancement and energy intensity reduction in the managerial complex of St. Petersburg for the years 2016-2018 and regulatory acts on the development of energy servicing activities. Based on calculations of St. Petersburg experts, realization of the energy saving events within the frame of regional programs should provide for 29.7% energy intensity reduction of GRP by 2020 as compared to 2007. Already today, this index has reduced by 13.9%. Starting of 2012, as a whole, state institutions have reduced their factual gas consumption by 26.5% and their energy consumption in water supply and sewage by 22.7%, while in heat energy production by 14.1%. Quite recently, the Sverdlovsk Region was among the leaders in energy efficiency; however, in the last few years it remains in the group of the weak sisters. “Regions neighboring to the Sverdlovsk Region have successfully established the process of receiving federal funding for realization of their programs on energy efficiency enhancement. The Sverdlovsk Region has not yet managed to report on the previous years and has not confirmed local investments in energy programs,” Director of the Energy Efficiency Union Dmitry Serebryakov said. In his opinion, the reason is the lack of responsible persons interested in working on energy efficiency among the top region’s leaders. The regions also lack mechanisms which would induce people introduce energy efficient technologies. Leaders of the group of medium budgetary provision in the energy efficient rating are Murmansk, Belgorod, and Kemerovo Regions, while the lowest indexes have Ingushetia, Astrakhan, and Magadan Regions. These regions also do not pay sufficient attention to administrative measures and their indexes of energy declarations delivery are very low. Reaching the target for energy efficiency set by the Russian authority, i.e., 40% GDP energy intensity reduction by 2020, seems hardly achievable. By estimates of the International Energy Agency (IEA), in the best scenario, it could be reached by 2028. This problem cannot be solved without development and implementation of a quality and wide-ranging policy of energy efficiency enhancement. However, in the situation of serious reduction of state financing of the programs, the stress is put on the regions. “The lever of energy efficiency is an index of economy’s livability and an instrument for enhancement of its competitiveness,” Olga Senova, Climate Secretariat of the Russian Social Ecological Union, believes.